The song Aira Gaira from Abhishek Varman's Kalank, which released on Saturday night, is going crazy viral. The video has over 32 lakh views on YouTube as of now and we are not surprised at all. The song features Kriti Sanon, along with Kalank actors Varun Dhawan and Aditya Roy Kapur. Aira Gara has been sung by Antara Mitra, Javed Ali and Tushar Joshi and it has been composed by Pritam. The lyrics are by Amitabh Bhattacharya. Kriti looks stunning in a purple lehenga, while Varun Dhawan and Aditya Roy Kapur can be seen dressed in a green and a black kurta respectively. The song has a peppy vibe we get a glimpse of Kriti Sanon's fabulous dance moves in the song. 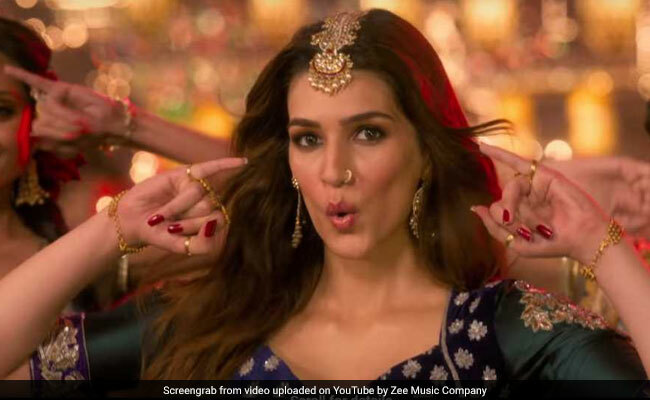 Ahead of the song's release, Kriti Sanon gave her fans a glimpse of her look from the song and wrote: "Jashn ki raat! Aira Gaira out today. Stay tuned." In a separate post, Kriti shared another still of herself along with Varun Dhawan and Aditya Roy Kapur and wrote: "Get ready to step up your thumka game with Aira Gaira. Out today." Dharma Productions' Kalank has an impressive cast comprising Madhuri Dixit, Sanjay Dutt, Alia Bhatt, Varun Dhawan, Aditya Roy Kapur and Sonakshi Sinha. The Abhishek Varman-directed film is an epic drama set in the 1940s.